Before I begin to put down Biblical reasons for believers to rethink the Revelation timeline I would like to give credit to Henry at Spirit of Discernment who has been fighting the good fight in defending our gospel. Henry has put forth great evidences that Jesus taught His disciples that he would come immediately after the tribulation. We can see His coming will proceed only momentarily the sounding of the trumpet call to gather His bride. Henry has laid out plain evidence that we will not escape the tribulation. He asserts that we will be raptured at the sixth seal. I have been advocating we will be raptured at the sounding of the seventh and last trumpet just as scripture teaches. Not simply do to the fact that this is the last trumpet of the seven trumpets do I say this is the timing of the rapture. I say this do to the finished work of our unfulfilled gospel, the mystery of God, which will without delay be accomplished as this last trumpet begins to sound. Please read the “Mystery of God” series of short post to follow the Biblical proof of what the mystery of God is and the timing of the rapture. Since I have proven conclusively that our rapture completes our gospel as Jesus brings us our salvation, which occurs at the seventh trumpet, is Henry wrong for calling the rapture at the sixth seal? No he is not, after all we see the changes in the sun and moon at the sixth seal, just as Jesus said in Matthew 24:29-31. We also see the heavens shaken and nations mourn His coming because the great day of wrath has come. So if Henry is right, that the rapture happens at the sixth seal, how can I be right that the rapture happens at the seventh trumpet? The seventh seal begets the seven trumpets. The seven trumpets are part of the six seals, more specifically the sixth seal. Only the bowls or wrath stands separate from the seals. Not only is the seven trumpets birthed out of the seals and reflects the sixth seal. The description we have of the two witnesses and their ministry also overlaps the sixth seal and the seventh trumpet. Each overlap reaffirms the stated events with more detail added. But they are the same events. What we have in the book of Revelation is the testimony of the seals, the trumpets and the two witnesses that we as Christians will go through the tribulation. The “come up here’ spoken to the two witnesses overlaps the Mystery of God, which overlaps the Lambs return and the saints who were redeemed out of the tribulation. It is like we are looking at a multi-layered transparency. If you want you can imagine it like a 3D picture, not a 2D linier picture. There are a growing number of pastors teaching the resurrection of the elect will take place at the sounding of the seventh trumpet. They believe the last trumpet blown at the coming of the Lord is the seventh trumpet (1 Thes. 4:16, 1 Cor. 15:52). They teach the two Witnesses represent the church. When the seventh trumpet sounds they believe the church will be resurrected and ascend into heaven in a cloud. They are convinced the mystery of God in Revelation 10:7 is the rapture described in Revelation 11:15. This interpretation has four critical errors. First, the mystery of the saints receiving incorruptible bodies will take place exactly when the trumpet of God sounds (1 Cor. 15:50-52, Mat. 24:30-31, 1 Thes. 4:15-17). The mystery of God in Revelation 10:7 is completed before the seventh trumpet sounds. Which means the seventh trumpet can’t be the same trumpet blown at the coming of the Lord (1 Thes. 4:15-16, Mat. 24:30-31). Second; it will be God who sounds the last trumpet at the resurrection of His elect (1 Cor. 15:52, I Thes 4:16). In The Revelation of Jesus Christ angels sound all seven trumpets. Third; there is no scripture that says the two Witnesses represent the body of Christ. Fourth, those washed in the blood of the Lamb are delivered out of the Great Tribulation between the 6th and 7th seals (Rev. 7:9-17). In contrast, the two Witnesses go up to heaven during the day of the Lord between the sixth and seventh trumpets (Rev. 11:12). These events take place at different times; each having different results. (Chart-The Second Coming of Christ) There is no resurrection before the 70th week begins, in the middle, or at the end. Without a doubt, Satan is using this debate as a smoke screen to prevent many from understanding the eternal consequences of the coming of the Son of Man. What I am saying is not only do we see the rapture at the last trumpet, but at the sixth seal and when the two witnesses are caught up. They are overlapping records of the same event. I do not advocate in any way that the two witnesses represents the church. They are real men from the past of God’s choosing. I do know, via my site info, that you have not read any of my other post on the mystery of God to see the evidences that I have laid out in scripture that the mystery of God is Christ return and the completing of our gospel. If you did, I do believe you would be considering the view I am putting forth. So your criticism is without the benefit of what I have presented to get to this place. You are criticizing my destination without knowing my turns on the road to get me here. Your 1st criticism states my first error was at the point of our bodies being transformed. You believe that this will take place as the trumpet sounds and you think the mystery of God is completed before the seventh trumpet sounds. Why? (Rev 10:7 KJV) But in the days of the voice of the seventh angel, when he shall begin to sound, the mystery of God should be finished, as he hath declared to his servants the prophets. I read the mystery of God will be fulfilled as the trumpet is beginning to sound. So your conclusion that it couldn’t possible be the same trumpet at the coming of the Lord is not biblical. Your 2nd criticism states that it is God who blows the trumpet and not an angel. Your reference doesn’t mention anybody who does the blowing. So like your first point, I have to consider your second point in error as well. (1 Cor 15:52 KJV) In a moment, in the twinkling of an eye, at the last trump: for the trumpet shall sound, and the dead shall be raised incorruptible, and we shall be changed. Your second reference seems to be off topic? (1 Th 4:6 KJV) That no man go beyond and defraud his brother in any matter: because that the Lord is the avenger of all such, as we also have forewarned you and testified. Your 3rd criticism states that scripture does not teach the two witnesses are the body of Christ. I agree with you. Your only error is to assume something in the body of my evidence that is not part of my evidence, but you wouldn’t know it because you have not even read what I have laid forth. Your 4th criticism states that the events in the 6th and 7t seals and the events of the sixth and seventh trumpet take place in different time periods. I wonder if you even looked at my chart. Who says these events are of different times. Evidence shows they are the same event happening at the same time from different point of views, if you will. If you believe in the lineal application of time in Revelation, would you point us to the real second coming of Christ? The Lamb has come at the sixth seal, the Christ takes His power and begins to reign at the seventh trumpet and finally we see the kingdom of this world has become the kingdom of our God with the rapture of the two witnesses. If your time is all lineal which two second comings are the false Christ and which remaining one is the real Jesus? To me your fourth criticism is without merit. For example, would you please write a history of every member of your family from sun up to sun down? If you have four in your family, would you expect your readers to assume all four family member’s days are lineal, one after the other? Or does you history overlap as you tell their stories of the day? Let’s say what they were doing at the noon hour. Now think of the story God is try to tell us, which is much greater than the story of individual history within a family in one day. I ask you to take the time to see what I am putting forth and not just assume what I am saying. In his vision John saw twenty-one events taking place in chronological order. 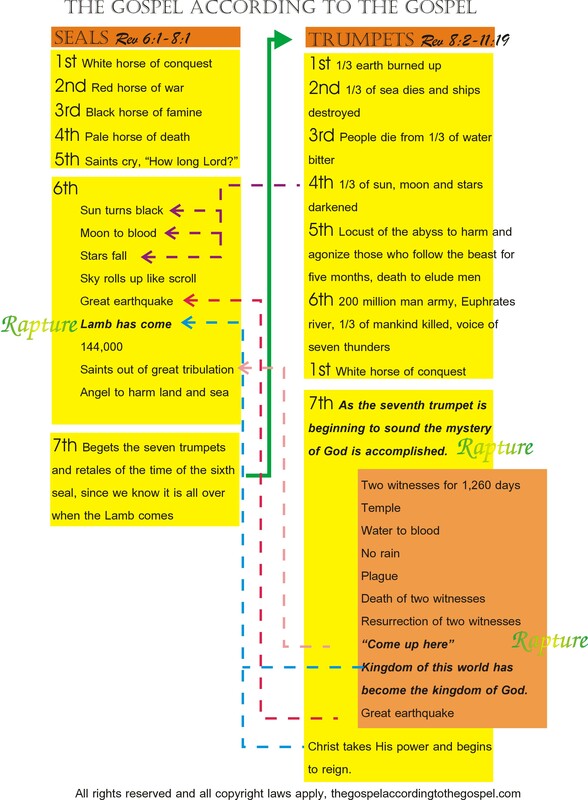 The seven seals are opened in Revelation 6:1-17 and 8:1. The seven trumpets sound in Revelation 8:1-13; 9:1-21; and 11:15. The seven bowls are poured out in Revelation 16:1-21. The seals, trumpets, and bowls take place one right after the other. Each event has different results. This proves these events cannot in any way be the same events. The elect are caught up after the 6th seal; the two witnesses after the 6th trumpet, which proves your interpretation of the rapture coming at the 7th trumpet is not biblical. It doesn’t matter what verses you put forth, if you start with a false premise you always end up with a false conclusion. Because of the covenant God made with Abraham, a remnant from Israel will have their sins taken away (Gen. 17:7; 12:3, Dan. 9:24, Rom. 11:27, Heb. 9:27). Five days before the sounding of the seventh trumpet, John saw the Holy One coming down from heaven clothed in a cloud (Rev. 10:1-7, Acts 1:11). On His head is a rainbow, his face is like the sun, his feet like fire (Rev. 1:12-16, 2:18). The Holy One is on the earth when He says the mystery of God is about to be finished. Which mystery is this? Is this the mystery of the body of Christ (Eph. 3:3), the mystery of His coming (1 Cor. 15:51), or the mystery of Israel being spiritually saved (Rom. 11:25)? This mystery of God will be finished in the days before the sounding of the seventh trumpet (Rev. 10:7). The Messiah is coming back in a cloud between the sixth and seventh trumpets to spiritually redeem a remnant from Israel (Rev. 9:13; 10:1; 11:15). Which means this mystery cannot be the mystery of the Church being revealed or the mystery of the elect being changed at the coming of the Son of Man. The second coming of Christ consists of four events. His second coming begins with the coming of the Son of Man. The resurrection of the dead in Christ and the overcomers on earth will take place sometime in the second half of the 70th week of Daniel; no man knows the exact day or hour (1 Thes. 4:15-17, Mat. 24:15-36). At the end of the second half of the 70th week, the Messiah will return to earth and fulfill the mystery of God; the salvation of Israel (Rev. 10:7, Rom. 11:25-27). Daniel 12:11-12 highlights the timing of the third and fourth events of Christ’s second coming. (Rev. 19:11-21; 21:9-10) Thirty days after the Messiah returns to earth (1290 days) the Word of God will appear in heaven to war against the Beast and his armies (Rev. 19:11-21, Dan. 12:11). We know this because the Abomination of Desolation (Beast) will become desolate on this day (Dan 9:27, Rev. 19:20). From Armageddon (1290 days) till the first day of Christ’s reign over the nations (1335 days) there will be forty-five days (Dan. 12:12). His coming will end when the Lamb returns with His bride (Rev. 21:9-10). I am amazed at your ability to ignore what you do not agree with. In your 2nd response to me you again state that the mystery of God will take place before the trumpet sounds. I copied and pasted Revelation 10:7 (you so called proof) that your understanding is not correct. So let me copy and paste it again. Do you see the words, “when he shall begin to sound?” If he isn’t sounding, he isn’t beginning to sound. You can not begin what you have not started. So as to be thinking men here, don’t just blow by what is plain in scripture and keep up your repetitive insistence on something that is not taught in scripture. Address what the scripture says. If one is going to blow a match out, they can not until they begin to blow. Hence, when he shall begin to blow the match will be extinguished. I do not believe that you can not see the simplicity of this example in what we are discussing here. You also totally blew past my response to your so called two proofs that God blows the trumpet and not an angel. I copied and pasted your references which spoke nothing of what you advocated and you choose to ignore this too. Are you trying to fool me or yourself by not addressing you so called proofs? Instead of being a man of diligence and study to address the blatant lack of support for your positions, you to continue to advance your position as if your past comments need no more support. So I will address your new rebuttals, but you need to give an account of past stated positions. If you don’t who will advocate for you when they read these comments? I have tried to show by examples from scripture Revelation has overlapping events, meaning we are seeing the same events from different perspectives with different details and descriptions. You without example say I am wrong, because the book of Revelation is in chronological. Being a good bible scholar and letting scripture interpret scripture, where was the scripture that teaches those 21 events in Revelation are chronological? You said,” The seals, trumpets, and bowls take place one right after the other. Each event has different results. This proves these events cannot in any way be the same events.” Nothing is proved, since you without the authority of scripture and the voices of a lot of men behind you, are teaching that Revelation is chronological. I don’t care if other people say it, where does scripture say it? Don’t blow past this one too, the question needs answering. Since your premise is the 21 events in Revelation are chronological, your further evidence of the events of the sixth seal and the sixth trumpet not being the same time, with overlapping events is without standing. If you could prove by scripture that these events are chronological and can not be explained by any other means, then you would have a position to stand on. Since you can’t, you should retract you comment to me, “It doesn’t matter what verses you put forth, if you start with a false premise you always end up with a false conclusion.” Yours is the false premise, since scripture does not teach what you are advocating. If I am guilty of putting forth scripture to prove Revelation is not chronological, you are guilty of putting forth no scripture. Paul I have to ask, what translation do you read? You say, “John saw the Holy One coming down from heaven clothed in a cloud (Rev. 10:1-7” Funny my bible says angel, not holy one of Israel. Do you see the word angel? Do you see again the word angel? Do you see the angel swore by the creator of all things there will be no more delay? Do you reject that Christ made all things? Mixing references of Jesus, Acts 1:11, Rev 1:12-16 and Rev 2:18 with this reference of the angel doesn’t make the angel in Rev 10:1-7 Jesus. Throwing in (Gen. 17:7; 12:3, Dan. 9:24, Rom. 11:27, Heb. 9:27) all in a string does not prove your point. The covenant God made with Abraham, the seventy weeks and once for a man to die does not make an argument nor prove anything. It only looks good if people do not look up what you are listing. Your conclusion the holy one on earth, Jesus, because you turn an angel in Rev 10:1-7 into Jesus by ignoring that scripture calls him an angel that swares by the creator, doesn’t prove anything. In fact, I have no idea what point you are trying to make by this, except to accidently show how mislead your argument is, or how bad your translation of the bible is. Which is it? Somehow you conclude the mystery of God is only Israel being spiritually saved. Your string together (Rev. 9:13; 10:1; 11:15) makes it impossible for me to follow your logic and especially your conclusion that the mystery of God can not be the accomplishment of our gospel in the body of Christ. Maybe you think the other angel is Christ too, but what would this prove. Could you show how you connect the dots on that one? To address your chronological four events of Christ second coming would only be a repeat of your need to address what is extremely lacking in your evidence. Not to mention, throwing strings of scriptures and using conjecture based upon your false premise of chronology is not proof. It only looks impressive and authoritive if people are to lazy to look up and read what you list. It is my hones hope that you will address what is lacking in your argument. Not to convince me or yourself of your position, but to help you see where you could come closer to what scripture teaches. Is there a teacher that you follow that advocates what you say, and if so who is it? Here is an explanation of the Holy One being the Lord coming down in a cloud at the end of the 70th week for the salvation of Israel. Hope this will help you see the truth of this passage. In Revelation 4:1, a door in heaven opens. John is taken in the spirit to see the events coming before, during, and after the coming of the Lord. The apostle watches as Jesus opens each seal of the heavenly scroll (Rev. 6:1-17; 8:1). After the 7th seal opens, six trumpets are blown by angels (Rev. 8:7-13; 9:1-21). After the sixth trumpet sounds, two hundred million demons begin to kill one third of mankind by fire, smoke, and brimstone (Rev. 9:16-21). Between the sixth and seventh trumpets John is back on earth. He sees a mighty Angel coming down from heaven. Anglos can mean angel, messenger, saint, or holy one. This Holy One has a rainbow on His head. His face is like the sun; His feet like pillars of fire. He is clothed in a cloud. On the Island of Patmos John saw Him. The Son of Man is in the midst of seven lampstands. His countenance is like the sun; His eyes are like fire. In His right hand are seven stars. Out of His mouth comes a sharp two edged sword. The Lord tells John not to be afraid. He is the First and the Last. He physically died on the cross but now He lives forevermore. Jesus has the keys to Hades and Death (Rev. 20:14). John is told to write down the things he has seen, the things which are, and the things which will take place after this (Rev. 1:19). Only the Son of God has eyes like fire. In Revelation 10:1, the Holy One has a face like the sun and feet like pillars of fire. A rainbow is on His head. He is coming down to earth clothed in a cloud. I am glad that you have submitted your comments on why you think the angel is Jesus. But you have left some very important questions unanswered. 1. Where does scripture teach that the 21 events in Revelation are chronological? 2. You need to address the issue of the mystery of God being accomplished not before but when the angel sounds his trumpet. These are key to your understanding of the book of Revelation and you have not supported your positions here. Please do not do a disservice to yourself and ignore my request for an accounting of these items. Now about the angel being the Lord. 1. Am I to assume everywhere Revelation mentions Jesus it is very clearly stated that it is the Lord, but here where it is not we are to draw this conclusion? As if scripture in this one instance wanted to be obtuse. 2. Am I also to assume this angel “Jesus” when speaking somehow lost his double edge sword when he spoke? 3. Am I to assume that this angel “Jesus” is not the one two whom the angel was swearing by, who created all things, since this angel was swearing to another? 4. How come you want me to believe that John accurately identified all the other angels mention in Revelation and named them so, and yet with this one he mistakenly records that he saw another mighty angel, when he meant he saw Jesus? His testimony is he saw another of what he was already seeing and recording and this one was mighty. But you want me to believe you over John? (Rev 10:1 NIV) Then I saw another mighty angel coming down from heaven. He was robed in a cloud, with a rainbow above his head; his face was like the sun, and his legs were like fiery pillars. Another means a continuation of what he was already experiencing. It wasn’t the Lord he saw, it was what he said it was, a mighty angel. Please also address the first topics as well. Here are the answers to your four questions. 1. The seals are opened before the trumpets sound. The trumpets sound before the bowls are poured out. There is no reason not to interpret these events as chronological. There is no evidence they overlap either. 2. The word Word of God appears in heaven, doesn’t touch the earth, after the 7th bowl at the supper of the great God. The anglos, which can be translated Holy One, physically returns to earth between the sounding of the 6th and 7th trumpets to fulfill the mystery of God. The Holy One is described like the Son of Man in Rev 1:13-16. Only God can fulfill the mystery of God, the salvation of Israel (Rom. 11:25-27, Acts 1:6-11, Dan. 9:24) This descent to earth has nothing to with the resurrection of the elect after the 6th seal, or the Word of God after the 7th bowl, or even the Lamb of God returning with His Bride. All four events take place at different times, for different reasons, each having different results. 3. Only Jesus can swear in this manner, only Jesus declared this to His prophets, only Jesus can fulfill the mystery of God. Hope this helps you see it. This is a critical truth in understanding the overall second coming. Gbu Dave. There are a few things I would like to discus with you about your answers. You say the seals are opened before the trumpets and the trumpets before the bowls. We have to admit that it would seem that they are meant to be in a chronological order since we read chronologically in our minds. Let us agree that there is no scripture that says the book of Revelation overlaps nor is scripture that says they are Chronological. So we are left with the evidences we see to make our conclusions. We have to ask ourselves is this a Chronological event or is this an overlay of future events that we see? Is it also further agreeable that point number one is not evidence but a theory at this time for the both of us? Of I may I would like to dissect point number two. 2.a. The word Word of God appears in heaven, doesn’t touch the earth, after the 7th bowl at the supper of the great God. Not sure what that has to do with anything? 2.b.b The anglos, which can be translated Holy One, physically returns to earth between the sounding of the 6th and 7th trumpets to fulfill the mystery of God. The Holy One is described like the Son of Man in Rev 1:13-16. Please answer the questions I previously put forth. 1. Am I to assume everywhere Revelation mentions Jesus it is very clearly stated that it is the Lord, but here where it is not we are to draw this conclusion? As if scripture in this one instance wanted to be obtuse. 2. Am I also to assume this angel “Jesus” when speaking somehow lost his double edge sword when he spoke? 3. Am I to assume that this angel “Jesus” is not the one two whom the angel was swearing by, who created all things, since this angel was swearing to another? 4. How come you want me to believe that John accurately identified all the other angels mention in Revelation and named them so, and yet with this one he mistakenly records that he saw another mighty angel, when he meant he saw Jesus? His testimony is he saw another of what he was already seeing and recording and this one was mighty. But you want me to believe you over John? Now this is something we both agree on. It is Christ who is our salvation, our justification, our righteousness, our hope etc. He is the one who takes all that the prophets have spoken of and finishes it. 2. D. This descent to earth has nothing to with the resurrection of the elect after the 6th seal, or the Word of God after the 7th bowl, or even the Lamb of God returning with His Bride. All four events take place at different times, for different reasons, each having different results. Again this is tied to 2. b. and I am awaiting answers on this portion of your explaination. There are many instances where scripture speaks of God who swore He would do something. In no instance does it ever say, when scripture records this, that God swore by Him who created everything. It is flat out, God swore. This other angel isn’t saying he swore, no he is saying he swore by Him, by God. There is a huge difference in what you are trying to connect together and what we actually have recorded for us in scripture. Are you now asking me to accept your understanding over John’s who wrote another angel swore by Him and not himself? Your forth point is not a point it is a comment, that I think we both agree about the divinity of our Lord. So as I see it we are left with two points. Is it chronological or not and at this point we both have as a starting point a theory, since scripture does not say one way or the other. And the other area of disagreement is whether on not Jesus blows the trumpet. Which there is no scriptural support for, except for this assumption you have made. Conclusion being there are two assumptions being made. For me first. I assume that Revelations is not chronological. You assume it is chronological and then also assume that “another angel” as John puts it is Jesus. Giving you reason to believe there are four visitations of Jesus to the earth. Is that right? Have you honestly read my short post on the mystery of God to look at my evidences to support my theory? Still looking for some answers to some honest questions I have for you. Any comment either. I know it is hard to find the time to not only blog, but be studied up, isn’t. Just to let you know that I did response to your last comment to me on my blog concerning this topic. It is quite an interesting topic and it is interesting to note the many different views concerning the events of Revelations. Like Paul I was lead to believe that the events are chronological (for the most part) – if you read my response on my blog you will see why I have drawn that conclusion.